Greetings everyone. Finally starting to feel like my "ole Sea Witch" self now that my nagging cough is all but gone. After being housebound for nearly 2 weeks, I had to bust outta my digs and head out to my booths and just mingle with the people for a few hours. The wall paper I had planned to hang this weekend fell through. Didn't like what arrived. It was pretty enough, but not what I wanted when I began to unroll it. You know how it is; you have a specific look in mind and I just want it the way I want it. So no wall paperhanging for me this weekend. LOL Instead, I concentrated on pricing and displaying transferware and antique valentines. I am a sucker for antique valentines. From the exquisite Spencerian scripts written on them to the sweet cherubs and pretty honeycomb hearts. Everything about these paper love letters makes me smile. 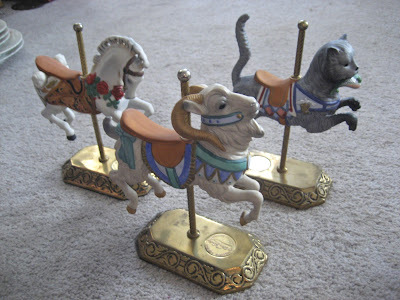 The valentine on the left sports a mechanical wheel that you can spin offering up different tokens of love. You can see the scale of these antique valentines by the large candlestick next to them. I adore transferware. There is something so lovely about the detail of the patterns on fine bone china or simple soft paste earthenware. From vivid flow blues to unique colors such as teal, black or mulberry all displayed on a million different patterns. I personally like to mix and match rather then stick with a single pattern and color. Blues seem to be the favorites, especially the flow blue when you can find it at affordable prices. The three pieces of "Willow" to the left of this photo are actually Homer Laughlin pieces made expressly for the Woolworth Company. All still have their original store tags on the bottom. The large plate as a price tag of 39 cents. How fun. 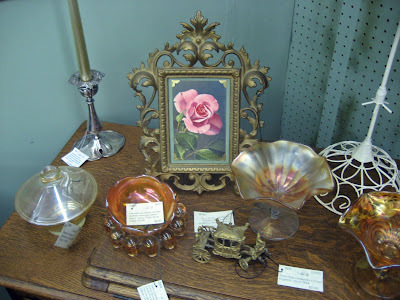 Had to mix in some Bristol glass and Victorian china painted pieces of cabbage roses just for a pop of color. Lovely mulberry and brown transferware pieces. Another cold and rainy day here in Atlanta. My last day off before returning to my "real" job and frankly, after being locked in the house for days due to miserable weather and a nasty cold with asthma, I finally had to bust out and run some errands. Off to Queen of Hearts to "fluff up" my booths and see what other dealers are bringing in. The front entrance to the Queen is always done up so beautifully and often with delightful whimsy. 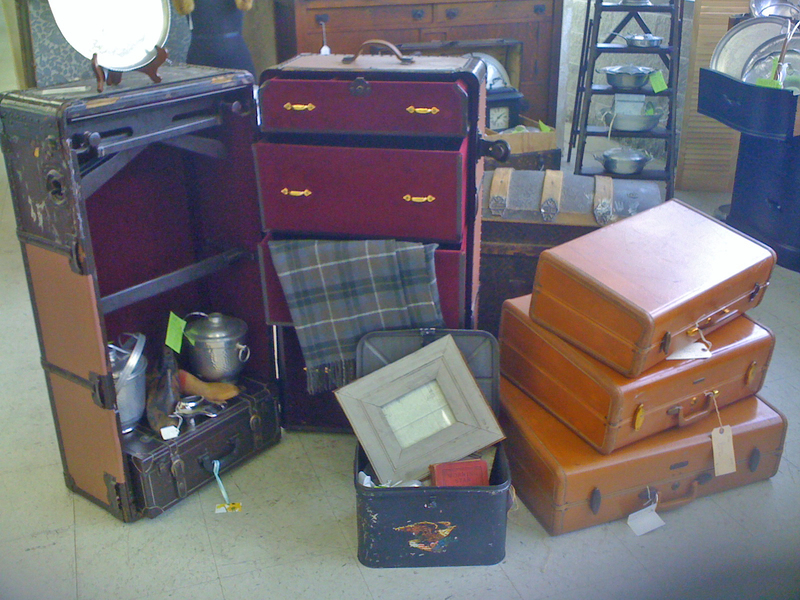 The decorators did a complete "trunk show" and stylized it with vintage aluminum. I couldn't help but smile as I looked at this marvelous display. The "comfort" feel came from knowing that I have booths in this marvelous location and am proud to be a part of the family of dealers here. Trunks of all sizes, shapes and eras. Perfect for displays, storage and collecting. Clever, clever clever. Someone cut out the front of a vintage suitcase and repurposed it into a nifty display shelf. 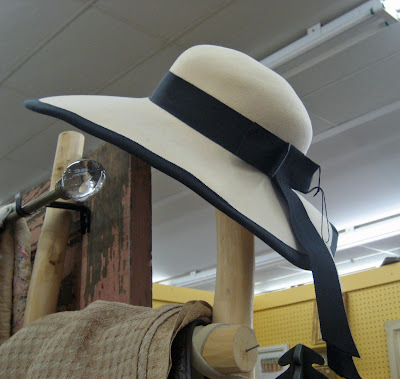 What a marvelous idea and lends a sweet vintage and "comfort" feel to it. 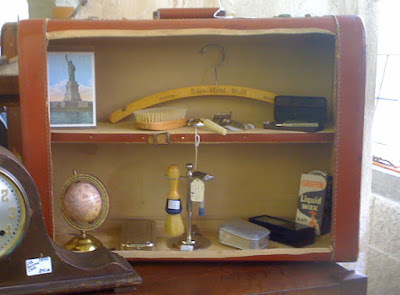 I'm now off looking for an old leather suitecase to do the same for a guest room. My faboosh sista, gave me this terrific mermaid sign. She found it at a local Ross (who knew?) and bought it for me. It now hangs in my kitchen and I love seeing it every day. Comfort in knowing my sister loves me and reminded of that as I look at my mermaid sign. Meet Leigha. This little cupcake is the daughter of one of my sister's co-workers. 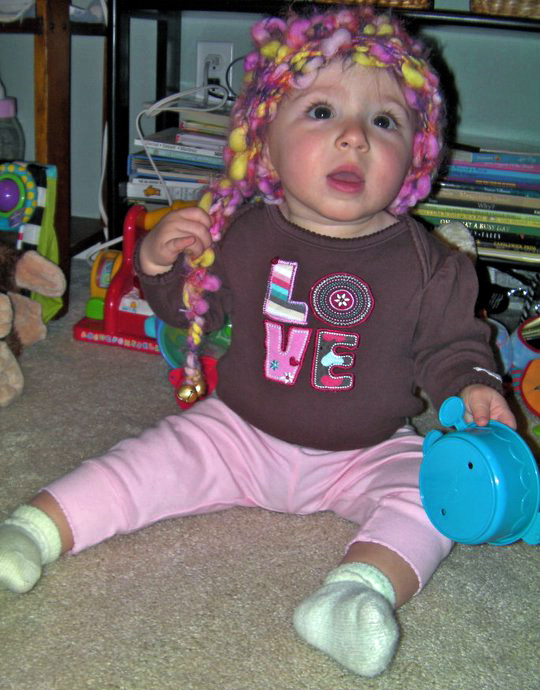 I had made the gnome hat she is wearing and the picture is pure delight. Comfort is a warm hat and a kissable baby. And finally, comfort food. Nothing like it. It was still raining and damp when I returned home from my errands. 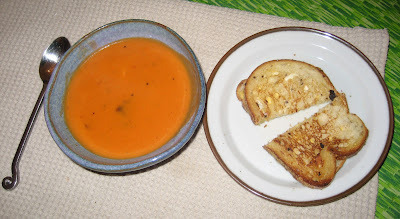 I was craving a family favorite...tomato soup and grilled cheese sandwiches. Not one to just open the can, I decided to gild a few lilies. Seared a few turkey apple sausages (sliced into pennies)in a little olive oil and seasonings. Two cans of Campbell's tomato soup, one can of water and 1 cup of heavy whipping cream and added the seared sausages and the soup is simmering. Picked up a fresh loaf of Publix 5-grain Italian wheat bread, sliced thin. A little butter in the frying pan, 4 slices of bread, slices of cheese and then a layer of Laughing Cow blue cheese and then last slice of bread and you are making the best ever grilled cheese sandwich. Nothing like a "grilled cheese blue cheese sandwich with tomato soup." Now that is comfort food. My honey couldn't get enough of it...both hearty and healthy. I was the lucky and I mean "LUCKY" winner and recipient of In the Light of the Moon's recent giveaway. 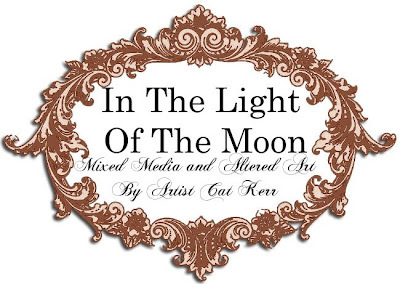 Cat's work is visual, emotional, whimsical and simply beautiful. 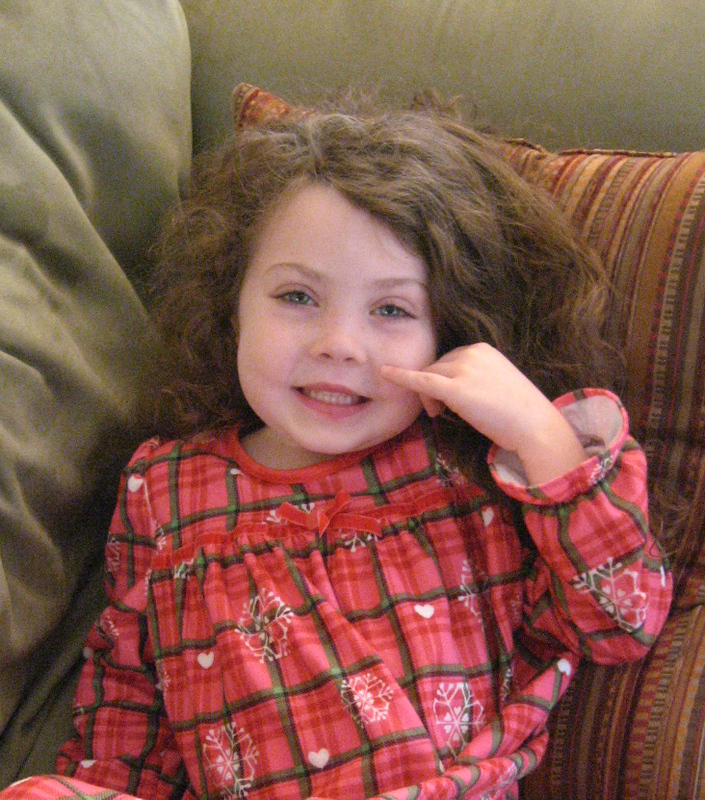 I was catching up on my blog and reading all of the heartfelt posts left after being away for many weeks as we rallied around my granddaughter and her surgery. Imagine my surprise when I saw that I was Cat's winner of one of her amazing stamped bracelets. All she asked is that I provide her with a word I would like on the bracelet. Talk about a piece being designed just for me. Well, two words immediately came to mind and that was "Exquisite Joy". It was how I felt once we knew that Kaitlyn was going to be okay. That her surgery was a complete success and all was cured. Exquisite Joy was the emotion that I knew from all of the prayers and good words sent my way and to be carried to Kit Kat. Exquisite Joy. Yes, that is what I wanted on this bracelet so as I wore it I would remember the Exquisite Joy that has come my way. So there it is. My lovely bracelet, hand wrought for me with the words, Exquisite Joy. Resting on a huge piece of barnacle with other sea treasures around it, I hope my photos did this lovely bracelet the visual it deserves. With the white snow all over Atlanta, I thought it would be neat to snap photos of white sea shells against the brilliant white snow. So here are a few tone on tone photos I took of shells against our wintery, white background. Greetings from the Sea Witch. So glad to be back blogging and reading all of our posts. I have missed you all and thank you for all of your prayers and support while we dealt with my granddaughter's brain surgery and her recovery. As I mentioned in the December 7th post, she has been cured and is at a near total recovery. Some medication side effects are her only issue right now and those should diminish in about 30 days when she is completely off the anti-seizure meds. Her hand is getting better every day and she will be back to her rambuncious self by the summer. Hope everyone had a wonderful and safe New Year and without sounding like a Miss America contestant...I truly do wish for "world peace." Our mother earth is dealing with a lot of anger around her and we, her children, are suffering. Acts of kindness have an amazing ripple effect around us, so pass them on to someone each and every day. Tell a stranger they have beautiful eyes or a welcoming smile; if someone wants your parking space, let them have it; buy the lunch for the car behind you at your next drive through stop; hug your children, kiss your companion and tell those you love that you love them. We can never say or hear it enough. 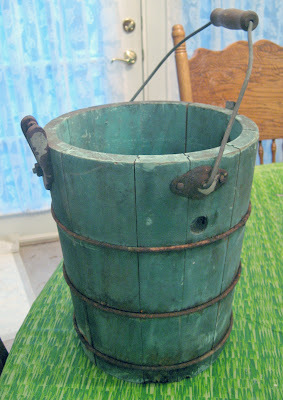 Had the opportunity to do a little antiquing last and this weekend and found some great little finds. Found this marvelous Heywood Hardy chromolithograph of a girl and her dog. Original frame and glass and the colors are brilliant and true. Nice large piece. Sir Galahad, one of the popular Romantic prints of its time. 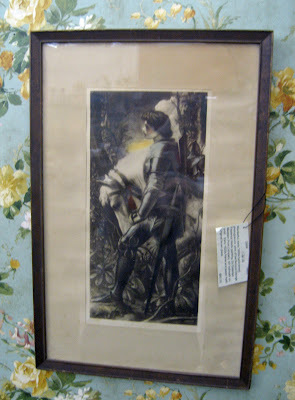 Hand colored and in original frame with glass. Perfect for Valentines Day. 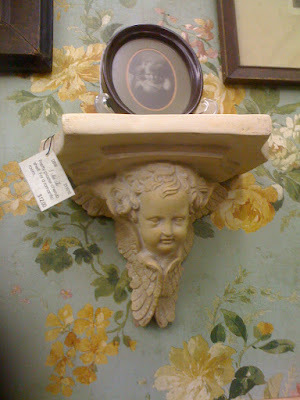 Crazy about this pretty little cherub shelf. Heavy plaster and has a great old world look to it. 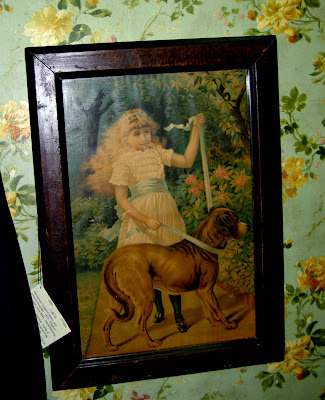 I like the antique, cupids awake print on it as well. 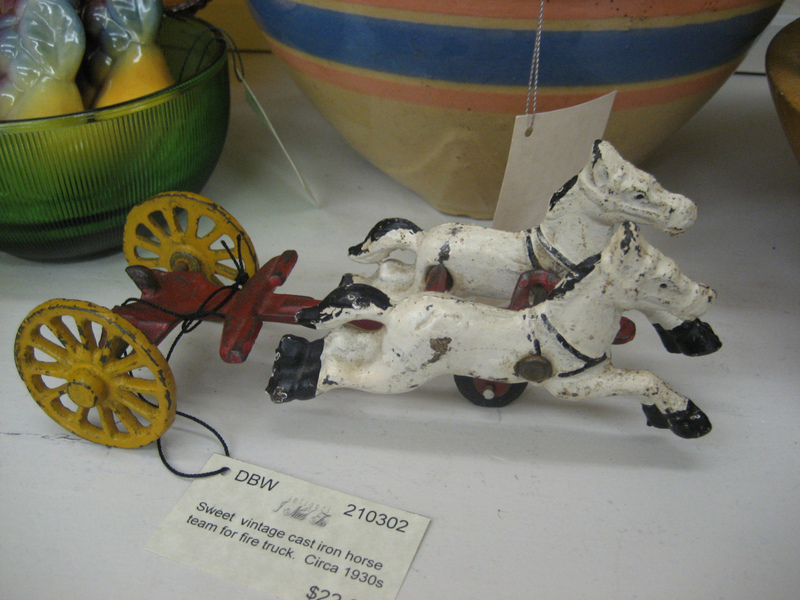 Neat, antique cast iron team of horses from a children's pull toy. 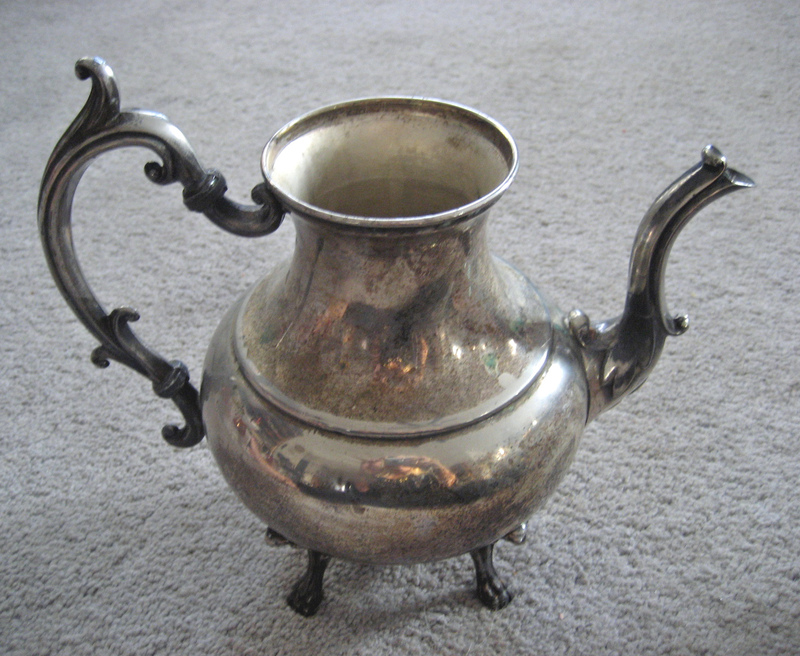 Had this in the store 2 days when an antique toy collector snapped this up and then asked if I had more. Oh how I wish I did. Toys are so hard to come by at affordable prices. 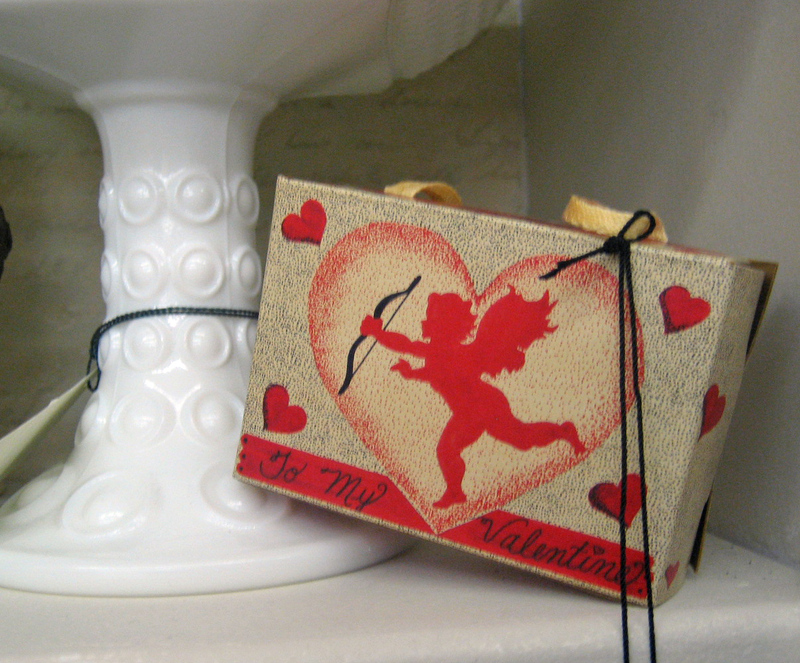 I remember handing out these little heart boxes filled with candies when I was a teenager. Found three of them in perfect condition and priced them at a price that even cupid would love. How fun to hide an engagement ring in one. I can see Audrey Hepburn wearing this fantastic Mr. John of New York and Paris hat. Perfect condition and just plain fun to wear. My find of the day. A gorgeous and large flow blue serving bowl. Perfect condition. 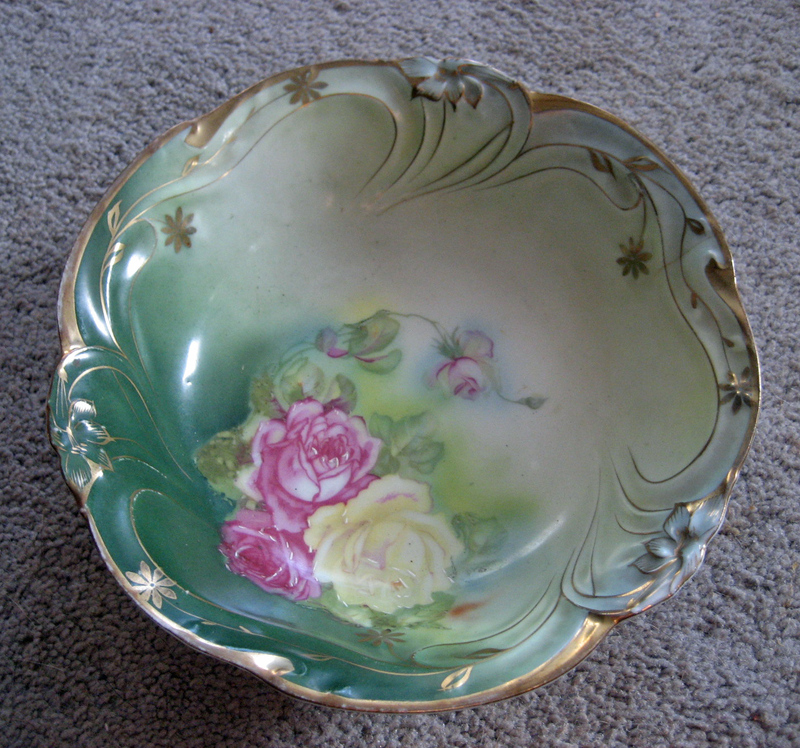 Lovely embossed scroll work on the bowl with gold lustre accents. Just lovely. 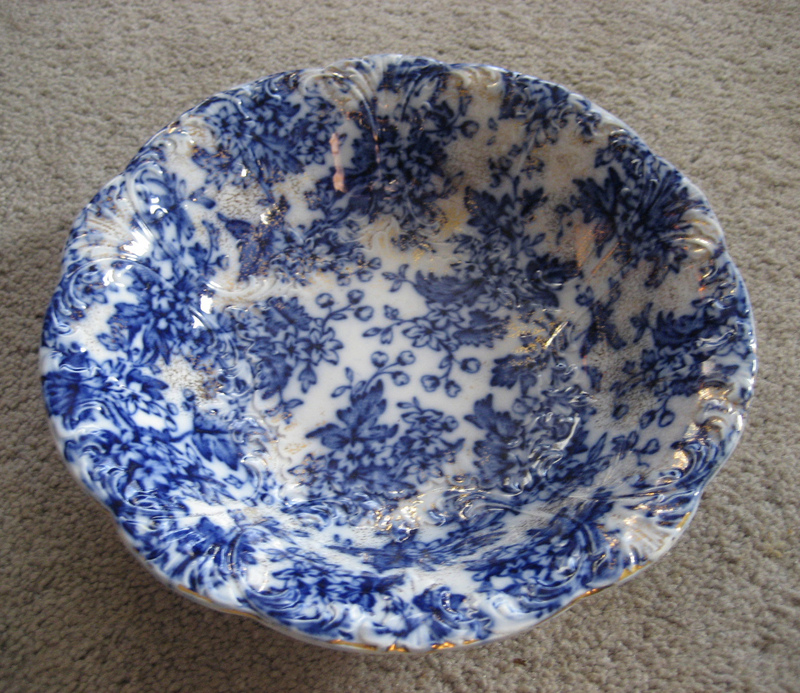 A lovely Victorian serving bowl with the famous cabbage roses hand painted on it. Love the scroll work along the edge. 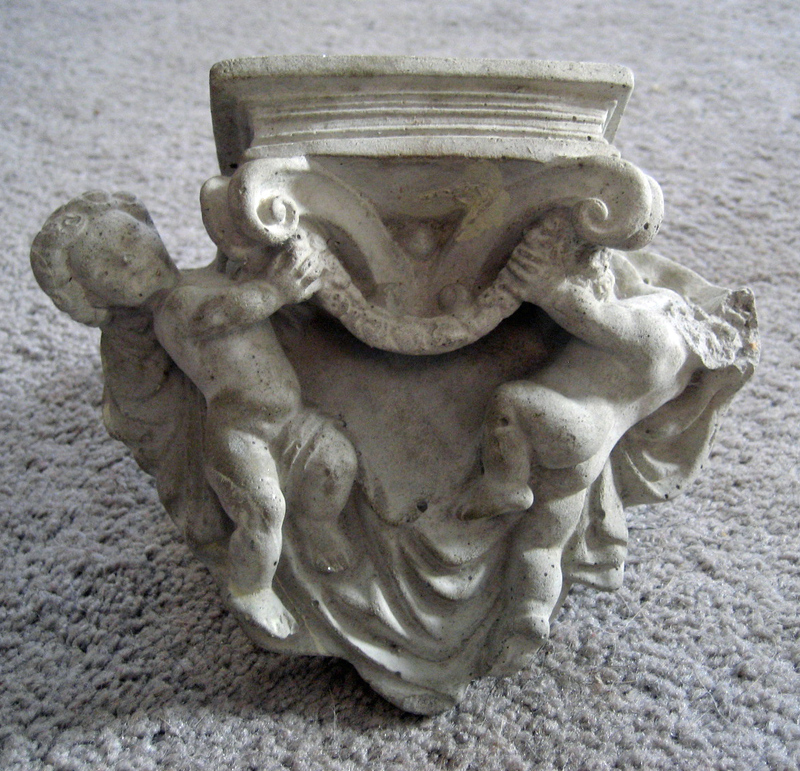 This pretty little stone shelf reminds me of Vincenza and Florence, Italy. Wonderful stone sculptures abound and the missing cherub head only makes it feel like Italy. I may keep this myself as I love the Old Italian look to it. I adore old quad plate no matter the condition. They have so many uses from serving up your favorite bread sticks to filling with fresh cut or silk flowers. Don't usually pick items like this up, but they have such a delightful look to them. Tobin Fraley carousel horses, I have since learned, are highly collectible. 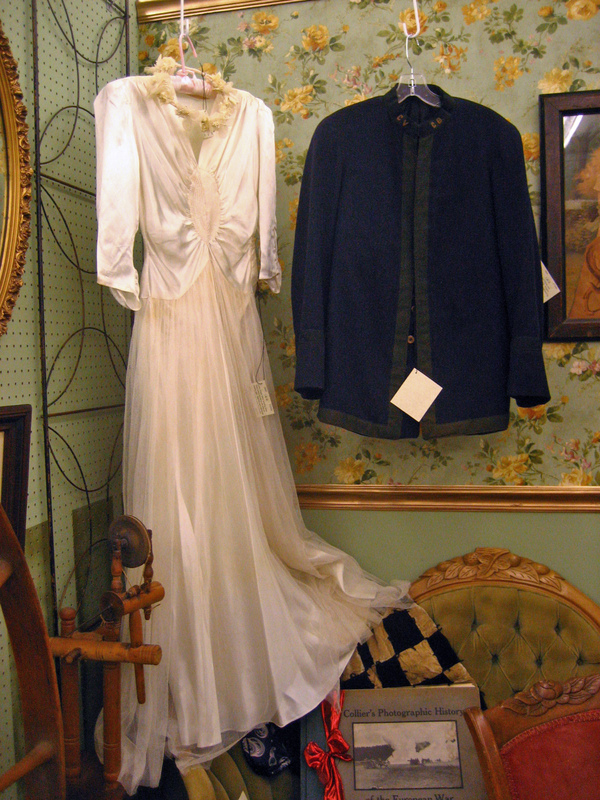 Vintage wedding dress from the 1940s. Satin is cut on the bias for lovely draping. Shaker great walking or wool wheel with a Minor's head assembly. 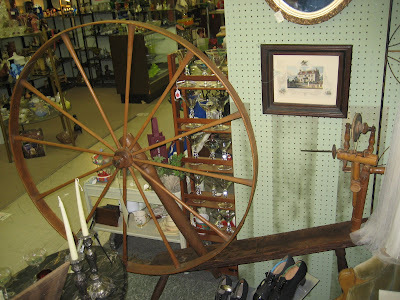 I have spun wool on this for years, but I am downsizing and am only keeping my one, castle wheel that I spin on all of the time. Brought out pretty vintage carnival glass from the turn of the century. A love the look of the soft matt carni glass myself. 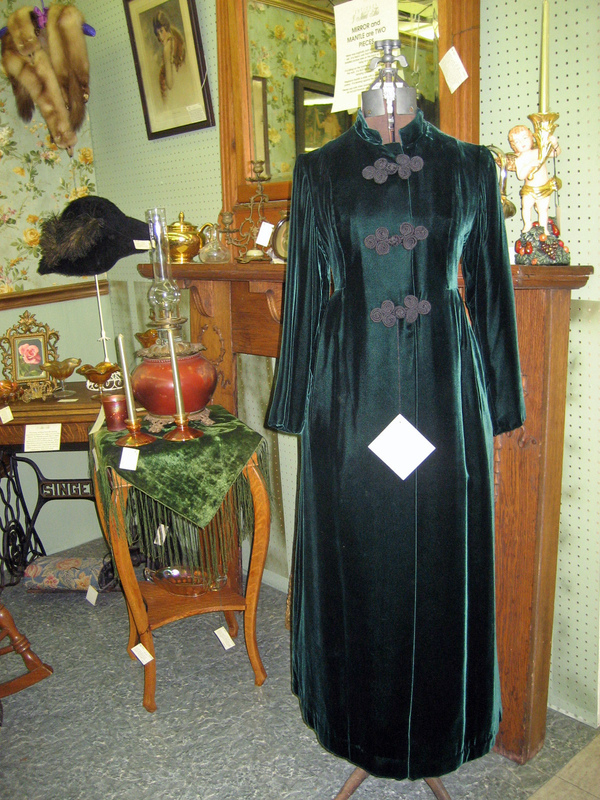 I put the green velvet coat on my Edwardian dress form and loved the way it looks. With the holidays over, I have emptied both booths of all Christmas/New Year items and am now working towards Valentines Day. Going to do a major redesign in my main booth over the next few weekends. 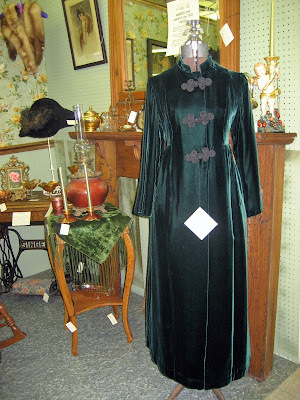 Want to give it a more gallery setup like my Victorian booth. Will post photos as the work progresses. Of course, after this recent setup, I took the time to walk through Queen of Hearts to see what other dealers were offering. Lucky me, I walked by Sassytrash's lovely booth and focused like a laser beam on a fantastic, milk paint aqua blue ice cream bucket. OMG...be still my heart. I grabbed this so fast and put it in my cart and had a trail of ladies following me and asking if I would sell it to them. Nope, not a chance. I have already brought it home and filled it with sea shells. I am a happy sea witch.